Pixie Puzzle Adventures will be familiar to some comic strip fans; as far as I can tell its the only feature in the Family Comics section that wasn't created especially for it. 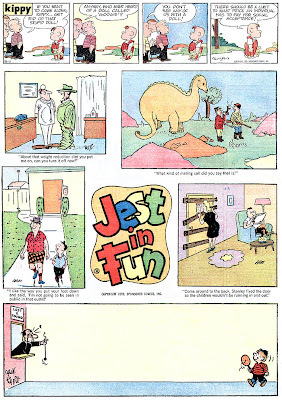 This activity feature by Matt Curzon originally ran in the New York Herald-Tribune Sunday comics section from 1948 to 1956. The puzzles aren't exactly Einsteinian in their complexity, but it is pretty neat how Curzon weaves them into a storyline. I know nothing about Curzon except the tidbit, gleaned with a little Googling, that he contributed work to some of the early comic books in the mid to late 1930s. hi Allan - I would like to obtain some originals of Matt Curzon's work for our family. He was my uncle (grandmother's brother). I met him several times and always thought he just did the "color college" in the NY Post?? Now I'm seeing there was much more to his work. What should I look for and where should I look - any ideas? He was married but they never had any children. When his wife died it was probably her side of the family rather than mine that disposed of or took whatever of Matt's may have been around. Matt came to the US from Minsk in 1903 at around 6 years old. His name at that time was Nathan Kurtzon - I guess he changed it to something more anglo sounding. Matt, my grandmother and the other siblings were all creative and loved to laugh - a very warm, funny family - gr8 senses of humor. The only "Coloring College" I know of ran in the NY Daily News on Sundays -- think it ran in the 70s and 80s. If you're looking for originals you should probably keep a watch on eBay. Everything shows up there eventually. Matt Curzon was my uncle, and when I was engaged in 1948 he put me in his cartoon, and when I was married in 1949 he did me as a bride. I remember the engagement ring so vividly. I am 80 years old. This would be fantastic if I could find it for my children and grandchildren. Thankyou. In case Mr. Curzon's relatives come back to this page at some point, they will also be interested in his short-lived 1946 daily feature Shaddo, examples of which can be seen in the Tuscaloosa News and the Pittsburgh Press. Starter URLs below. 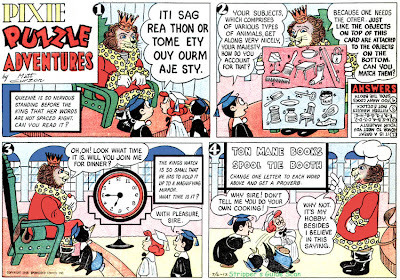 The Milwaukee Journal carried Pixie Puzzle Adventures, for sundays at least, in 1952. The niece who appeared in the strip might find herself, albeit in black and white. 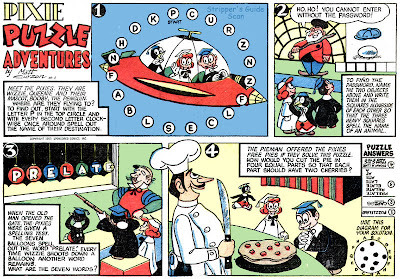 Pixie Puzzle Adventures was also offered in daily form, and was carried by the Beaver Valley (PA) Times in 1951. The starter URL below is to a promo photo of the artist. Hi Robert - I knew his wife, Gussie Curzon, very well (as a young child). Did you ever find Matt's work? I guess maybe Bill Lignante was a pretty serious baseball fan after all. He, along with George Olesen, took over Ozark Ike in 1954 when the master, Ray Gotto, left seeking greener pastures. I always thought that the work of the clean-up crew of Lignante and Olesen was rather perfunctory on that formerly great strip. 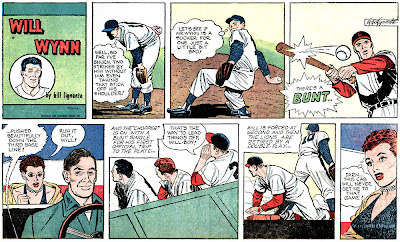 But when Lignante developed a feature for Family Comics what did he come up with but another baseball yarn, this one titled Will Wynn. I take that to mean that Lignante really loved the game. Or, in the spirit of glass half empty, does it mean that Lignante just used it as a way to recycle old art and plots from Ozark Ike? This strip was the front page for the Family Comics section, so Maurer or whoever published it must have thought it would hook the kids. Since the section ran in early summer, and kids actually cared about baseball back in those good old days, perhaps he was right. Here's a delightful Family Comics item called Woody Forrest from that oh-so-smooth pen of Henry Boltinoff. 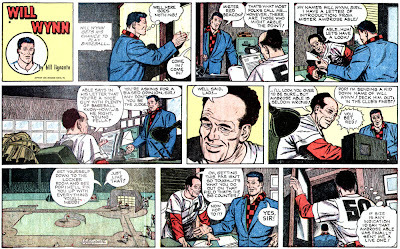 Boltinoff did a lot of filler strips in DC comic books, plus long runs of the syndicated panel Stoker the Broker and the strip Nubbin. However, he is probably best known as the cartoonist on Hocus-Focus, that visual puzzle where you have to spot the differences between two cartoons. When you think about it, Boltinoff may have the most recognizable style of any cartoonist on the planet. How many cartoonists can boast that millions of people scrutinize every little detail of his work on a daily basis? You know, I've always wondered. Does Boltinoff draw one cartoon for Hocus-Focus, then make the second by doing adjustments on a stat, or does he draw the two cartoons from scratch? I've always assumed it has to be the former, but with Boltinoff's incredibly smooth and consistent style I bet he could do it the hard way. I'm wondering about how "Hocus-Focus" were drawn, too. Anyone here ever saw an original for Boltinoff's puzzle? How was it drawn? Actually, I know Boltinoff mostly as the DC guy. Although lately I have been buying a lot of cartoon magazines from the forties and he is all over those. By the way, Woody Forrest is one of the few that were offered on e-bay. I think by Lowery as well. Looks like that old army cartoon Beetle Bailey! Very similar style! Well now here's an interesting one. 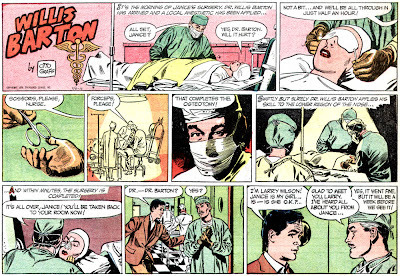 Willis Barton MD is, as far as I know, the only comic strip ever about a plastic surgeon. That's almost as odd as my very favorite doctor strip, The Adventures of Peter Goldstream, Crusading Urologist. 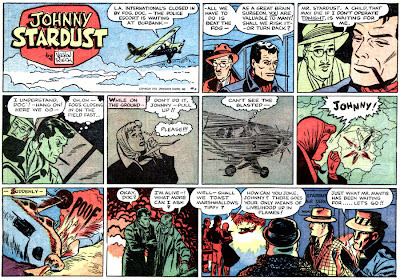 The art on this strip by the pseudonymous Otto Graff is really intriguing. Obviously there's a lot of Stan Drake/Alex Raymond influence. Am I crazy or is there some possibility that this is the work of a very young Neal Adams? I swear I'm seeing some of his signature flourishes in some panels. Adams would have been a tender 19 years old at the time, but hey, the guy had a major syndicated strip at age 22, so why not? What say you? Neal Adams never mentioned this strip. And I read a lot of interviews with him. He did mention working with Tom Sawyer early on in his career. I have stuff of his in Boy's Live where you can clearly see the connection. If Adams did this (and I do see what you mean here) this must have been before that and he must have been even younger. This one has more swipes than Shelly Meyer. Before I read your commentary, I thought, "Gee, Stan and Neal and maybe Alex, too." This could have been done by anyone (except me). Hmm, maybe even... Shelly? Sheepishly I have to admit not knowing Shelly Meyer. I know Sheldon Mayer, but you couldn't possibly be referring to him. Anyhow, Leonardo de Sa wrote me privately that he thinks this is Mel Keefer, and he's going to check with him to see if Mel recalls doing the feature. 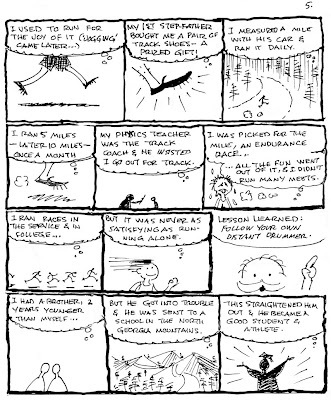 He's a better candidate for two reasons - one, I think he was in California, and two, from what I've seen of Keefer's work its full of swipes like this strip. I'll pass along anything I here from deSa. I think John is actually referring to Shelly Moldoff, who was famous for his Alex Raymond swipes when he drew the Golden Age Hawkman. In later years, Shelly ghosted Batman for Bob Kane. Please excuse the error, that message was from Alberto Becattini. Most likely this is Vernon Rieck's work again. The long "b" in "by" is characteristic of him as is the sly "OTTO GRAPH" in the box as the signature. He had ghosted on Mary Worth, and was always developing copycat strips that spoofed known comicstrips of the day.He had a very sly sense of humor and loved puns. I came across an original comic strip "Jest In Fun" signed Hector West, does anybody know any info on this artist. I haven't had any luck. David H.
This was considered the throwaway page in the Family Comics section, it was sometimes dropped in favor of an extra ad for the grocery store. In addition to the strip Kippy that always ran along the top, it featured gag cartoons, mostly by second and lower tier gag cartoonists. Looking through the run, I can read the following signatures: Frosty, T.H., Wenzel, Hoifseld, Wallace Ashby Jr., George Wolfe, Ford Button, Reg Hider, Serrano, Leung, Hank Martin, Bob Serbicki, Goldstein, Troop, Levinson, Hagglund, Taber, Jack Tippit and S. Harris. Although all the cartoons are signed, quite a few are illegible. Few of the cartoonists contributed more than a few cartoons during the run I have on hand. The strip Kippy was by Bernard and Jordan Lansky, and it's the only feature known definitely to have survived the Family Comics section. Lansky sold the strip to Field Enterprises and it ran for two years starting September 12 1960. After Field canceled it Lansky apparently shopped it around again, and Columbia Features Syndicate picked it up, now as a single panel cartoon, late in 1962. Kippy's second chance was fleeting, though, as the panel was again canceled around March 1963. "S. Harris" is Sidney Harris. He drew cartoons for the New Yorker and some other magazines. Jack Tippit is another cartoonist I recognize. He drew comic panel "Amy" for several years and also assisted on number of strips. Back to Sponsored Comics on this fine Monday morning, which finds me with a painful sunburn. I went to Tampa on Sunday to listen to Barack Obama make a campaign speech, and stood out in a broiling sun for hours. I tell you this, of course, to rub it in to those of you still shoveling snow up north. 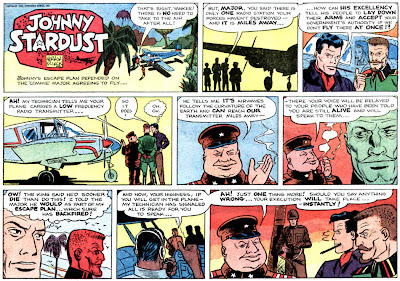 Anywho, here we have Johnny Stardust, a very well-drawn adventure strip by Vernon Rieck. Rieck was obviously one of the many 'toonists under the spell of Caniff, with a little Mel Graff and Alex Toth influence also evident. His only definite syndication credit was when he took over the Oh Diana strip in its last year of publication, but he was listed in E&P for a number of other strips, none of which I've been able to document. Most of these undocumented strips were syndicated by Velerie Productions, a company I know nothing about. I see some comparison to William Overgard's work on Steve Roper as well. Not tahtb the drawing is in that league, but some of the inking is similarely sketchy. Veleri Productions was my father's company (VErnon LEroy RIeck) and yes Johnny Stardust is probably his most famous strip. Thanks for posting. Regarding your dad and Veleri Productions, can you help me out on these other strips? Where did these appear? I'd like to give your dad his due in my Stripper's Guide listings, but I haven't found these in any newspaper. Stories of Real People & True Adventures were published as weekly strips in a Lutheran Church (Missouri Synod) newspaper for kids. I have some and can scan them and email them to you. There are over 100 strips. Vernon was devout and also did some editorial type cartoons addressing School Prayer type social issues. My father, Vernon Riecks, started out as a cartoonist when he was bedridden as a child with pneumonia. He would draw the stories he heard on the radio, while bedridden. He wrote to Mr Coniff and sent him some drawings. Mr Coniff wrote back and was very encouraging. 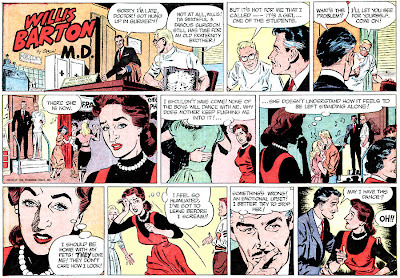 Later, Vernon moved to NYC in the 1940's & worked as a cartoonist on his own strips, & as an artist on other's strips. He said it was very hard to make a living. In the 1950's, he worked at Warner Bros stufios, among other places, & drew multiple Christian cartoons. Vernon created his own production company, Veleri, which owns all the rights to his original artwork, including Johnny Stardust. It's great seeing Jim's art again. I'm happy that you're posting it!